Safe, scenic course on rolling hills, some fairly steep, with numerous large trees. Shifting winds are a factor. Long tees on 4 holes bring length to 6167'. I-75 to US 35 East, exit Smithville Rd. south 1 mile past 4 lights, left on Highridge Ave., 2 blocks to left at maintenance entrance. 1st tee at end of parking lot. One of the first courses I ever played. I have been back several times since then and always enjoy playing here. It is a very popular, sometimes crowded course, and worth the slow play. Truly and old classic course that you can play multiple time in a day and not feel bored. One of the first courses I ever played outside of c-bus and is still worth the drive over every time! This course is very repetitive and hilly, while having a "metro park" feel,it plays longer than most city park courses and is a good "big arm" course as well. 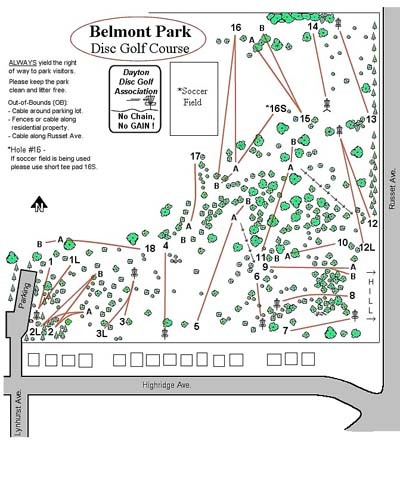 A little hard to navigate so pay attention and the shift from hole 11 to hole 12 takes you clear across the park but if you have trouble finding it just ask a local they're quite friendly and it's a crowded course so someone will be there for you to ask. Couple of holes can be confusing on which pin to shoot at( it's the 1 further away). For me the 2 most interesting features of this course are 1.the area with an elevated tee box where the tees for 3 different holes are together but not in each others way and 2. Next to hole 5 I think is a snack shack with food, drinks, and discs right on the course,bummer it's only open in summer though. In short worth playing if you're down there but don't travel a long ways just for this one but would be a great addition to a multiple course day. Rolling terrain, trees, long drives...very cool course. Baskets are so far from the tees, in some cases, that it can be hard to find them. Park entrance is unusual, and the course was pretty busy. We had to wait for the group ahead of us on almost every hole, so be patient, as this seems to be a disc golf hotspot. I think this is the best course layout in Dayton. That being said, it is almost always crowded. If you don't mind waiting on the people in front of you at every hole, this is certainly a course worth checking out.